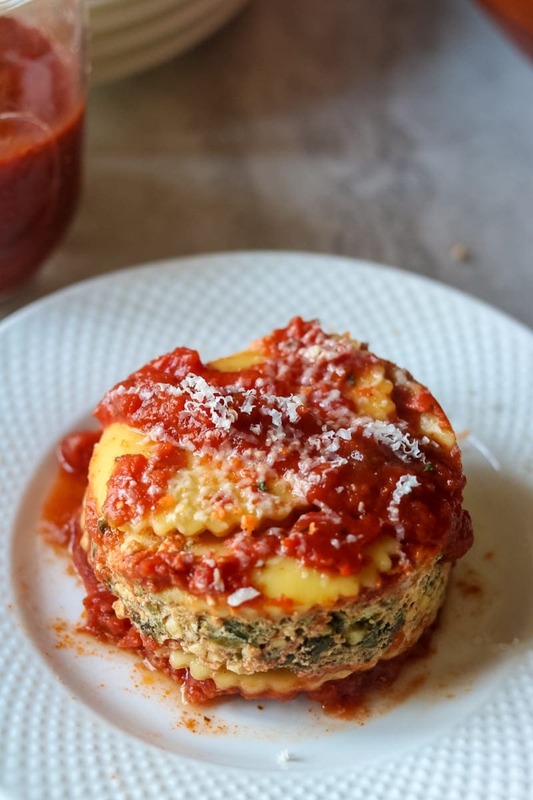 Ravioli Lasagna is a creative twist on traditional lasagna that features frozen ravioli, tangy marinara, and a creamy filling made with cottage cheese and fresh spinach. This ravioli lasagna comes together in minutes and will be your family’s new favorite way to enjoy pasta! Yesterday, my son turned 10–that is DOUBLE DIGITS! I am still in state of shock. It seems like only yesterday I laid in a hospital bed for days and waited patiently for my son to arrive into this world, after being 9 days late! When Tate entered this world, I fell so head over heels in love my heart felt like it was going to burst. I could write story after story about how this sweet boy has enriched my life and taught me so much. But bottom line–I am blessed to be his mom! And for his birthday, this sweet boy almost always requests Ravioli Lasagna. Who can you blame the kid that he is in love with this ravioli lasagna? Tender cheese ravioli is swimming in homemade marinara, that is layered with a seasoned cottage cheese and spicy pepperoni. And to boot, I make this lasagna in individual ramekins, so the dish has restaurant presentation, making my son feel like a King on his birthday. Personally, I am elated that my son loves this ravioli lasagna so much. Not only is it so easy to put together, it is a cheese and pasta lover’s dream come true. Which I admit fully to being both. So let’s fire up the ovens and whisk ourselves away to a little villa in Italy. I may even pour myself a glass of wine–I deserve it after 10 years of being a Mommy, right?! It is incredibly easy to make this ravioli lasagna–you don’t even need to defrost your frozen ravioli! Mix together cottage cheese, egg, and spices and spinach if using. Grease 4 (8 ounce) ramekins with olive oil. Spread a layer of marinara sauce on the bottom of each ramekin. Layer ravioli on bottom of ramekin, overlapping slightly. For small ravioli, I find 5 is the magic number, for large ravioli, 3 works perfectly. Top with cottage cheese mixture and 3 slices of pepperoni if using. Add 1 tablespoon of marinara and top with an additional layer of ravioli. Finish with 2-3 more tablespoons of marinara and cover each ramekin with foil. After baking, allow each mini ravioli bake to cool for 10 minutes and then loosen sides with butter knife. Let’s say that you want a SUPER easy, but still super tasty ravioli lasagna–which, let’s be honest, that is going to be 99.9% of the time. Skip the individual baked ravioli lasagnas, and make a ravioli casserole. 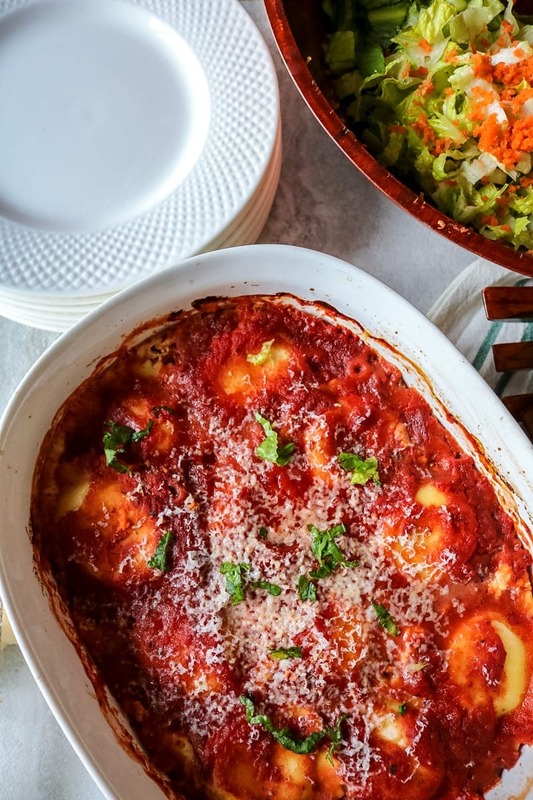 Instead of layering the cheese ravioli and cottage cheese filling in ramekins, layer the ingredients in a 2 quart or 8×8 casserole dish and you will have an easy family dinner ready in no time! And I promise the ravioli bake, is just as tasty as individual lasagnas! Grease your casserole dish with olive oil. Cover bottom of dish with a layer of marinara sauce. Top marinara with a layer of ravioli, overlapping slightly. Spread cottage cheese mixture over ravioli. Top with pepperoni if using and then another thin layer of marinara. Finish the ravioli lasagna with another layer of ravioli and a generous layer of marina sauce. Any ravioli will work. Refrigerated or frozen. Meat filled, cheese filled, spinach filled. For fresh ravioli, cut cooking time by 10 minutes. I love the bite that pepperoni gives to this ravioli bake, but often make it without for a vegetarian version of ravioli lasagna. Don’t like spinach? Leave it out. You can also use 1/2 cup frozen spinach defrosted and drained. Because I use cheese ravioli, you do not need to add a layer of mozzarella cheese to the top of the lasagna. Simply topping with freshly grated Parmesan is just the right amount of cheese needed and allows the the flavors of the marinara and ravioli to shine. Feel free to use any jarred marinara sauce you like in place of my homemade tomato sauce. Switch out traditional lasagna noodles for cheese ravioli to make a delicious, cheesy, Baked Ravioli Lasagna. Mix together cottage cheese, egg, spices, and spinach. Set aside. Grease 4 8 ounce ramekins with olive oil. Add 1 tablespoon of marinara sauce and spread over bottom of dish. Place a layer of ravioli over the sauce, layering slightly to cover bottom of dish. Spread 2 tablespoons cottage cheese mixture over ravioli and then top with 3-4 slices of pepperoni. Top with an additional 2 tablespoons of marinara and repeat layers. Top with one final layer of ravioli and 1 tablespoon marinara sauce. Cover with foil and bake for 30 minutes. Uncover and bake for additional 10 minutes. To serve, loosen sides of lasagna by running a butter knife around the ramekin. Place a plate over the ramekin and flip out the lasagna. If using fresh ravioli, decrease cooking time by 10 minutes total. Feel free to use frozen spinach, just defrost and wring out excess moisture. And it would be 1/3-1/2 cup frozen spinach after defrosting. This recipe has been updated with new pictures on my son’s 13th birthday–time keeps flying! Yum that looks delish! I love adore lasagna and this looks way way easier then making the traditional one! So much easier and so much tastier! I can’t blame him one bit – this looks delicious! All those layers are making my tummy rumble this morning. Thanks Heather! It is a pretty amazing dish, especially for being so easy! This is brilliant! Perfect for a weekday dinner but could also be used to serve guests on a Saturday night! It looks fancy and its a great hack! Exactly. It is so quick you can make it anytime but fancy enough to impress guests with! 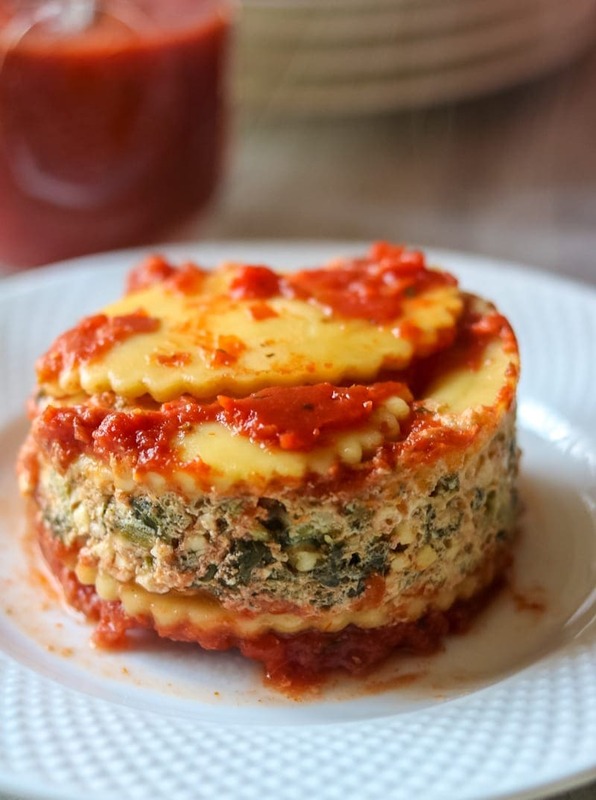 What a great twist to traditional lasagna! This looks great! YUM! Lasagna is such a family favorite and I love your new take on it! This sounds awesome! We love Italian food at our house and I cannot wait to try this! Thanks Paris! If you love Italian, you will be all about this recipe! Hello! You’ve reminded me that I haven’t made a lasagna for far too long! I love these cute little ones with pepperoni in! Making it tonight! Should I boil the ravioli first? No need to cook ravioli first. I hope you enjoy. Totally agree. I love spinach. My son is 18, but when he was 13 he became severely lactose intolerant. He has handled it well with the exception of lasagna. This is the only thing he says he misses (along with pizza), and THIS version is positively divine!! Oh Kim, your poor son. Have you tried tofu mixed with nutional yeast, garlic, oregano and egg in place of the ricotta/cottage cheese mixture? My son was allergic to dairy until 6, so I would do this to get my lasagna fix. Not the same but it worked. Wow I have never heard of this, but it looks really yummy. This is the perfect comfort food I was looking for! Thanks for a great Italian recipe! Oh goodness! This is exactly what I was hoping it was. Pinning! Yea!! I am so glad it was what you were wishing for! Enjoy! Love the idea of using ravioli here. And I was traumatized enough by my 10 yr wedding anniversary lol. When my oldest turns 10 this June I imagine I will be in a tizzy! I was a bit more emotional than I thought I would be. It was rough! Thanks Catherine! We had a great day celebrating our son! Happy birthday to Tate! This looks so delicious! I’d totally pick it for my birthday dinner! WHAM BAM – THIS RECIPE is just on a whole other level! It’s like pillow lasagna! Thanks Erica. He had a great day and we ALL enjoyed his birthday dinner! wow this lasagne looks amazing, I want to stick my fork through the screen and take a bite! Enjoy these special moments with your son. They grow-up so quickly. The dish looks as special as the occasion. Thanks Faye–the time really does fly by! Looks like the perfect comfort food to me! Pinning! I love lasagna.I’m totally a lasagna person. lol. This is a good recipe to try. Thanks for linking up to the Bloggers Brags Pinterest Party. I have pinned your post to the Bloggers Brags Pinterest Board. Hi Kristen! Happy Birthday to your sweet son. My son celebrated his 8th birthday yesterday. His favorite meal is my homemade mac and cheese with ham tossed in it. Thanks to Easter leftovers, this was an easy meal to make. I make a similar ravioli lasagna and we love it. Your twist of putting it in a ramekin is fantastic. Those individual serving probably cook quicker and are perfect for freezing and lunch boxes. Love it!! Happy Birthday to your son!! It sounds like he would pick what my daughter would like (without the ham). 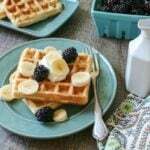 I hope you give this recipe a try and enjoy it. That is how I feel about this dish–total comfort at it’s finest. Kristen – this looks fabulous! I love the single serving size, looks so elegant! 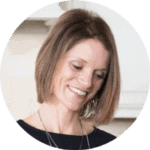 Thanks Allie, it seems so fancy and yet it is insanely easy! What a great idea!! I’m always looking for ideas that I can make with the grandkids and they would love assembling this (and eating it too)!! Renee, this is perfect. Easy enough for your grandkids to do with you and a dish they are sure to love! I really love this recipe. It’s a simple concept but I never thought to do it. I also appreciate your attention to healthy wholesome ingredients. I’m going to keep this and give it a try. Thanks! Thanks Lisa. I love when something simple strikes me and can inspire others. Enjoy! Ravioli in lasagna is such a fabulous trick! I can’t wait to try it! 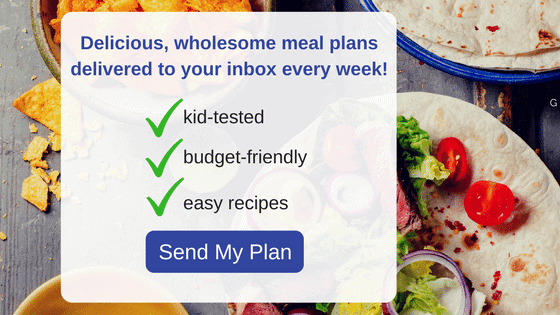 Thanks Marjory–I just know you will love it! Okay this is fabulous! Happy birthday to your son! This is creative! Great recipe idea! I’m a sucker for anything that will get me to lasagna for dinner faster! Well then you found your new favorite lasagna!! Heather, this will make your daughter so happy and your life SO much easier!! Love this recipe, Kristen! SO creative! LOL!! That is my husband for you! And our babies grow so fast! So hard to believe! It looks great and I can’t wait to try it, but I missed the “mix the spinach with the cheese” step so it got sprinkled on instead!